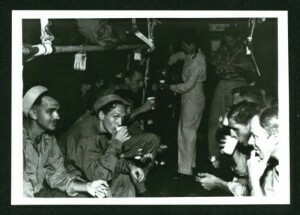 The recent publication of the USS Houston (CA-30) Photographs, adding to the growing Military History Collections at our Digital Library, marks another major milestone and means even more research potential for remote scholars unable to visit our rich USS Houston physical archives and materials. 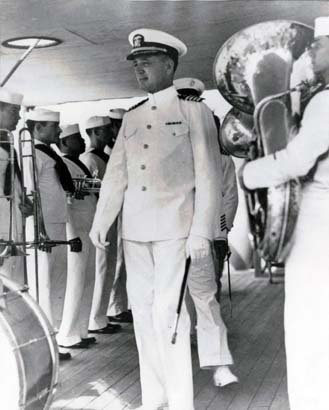 Pulled from the photographs of the Cruiser Houston Collection, this new digital collection highlights the history of the heavy cruiser and her crew–the survivors, prisoners of war, and those who gave all. The flagship of the Asiatic Fleet during World War II, the Houston fought in the Battle of the Java Sea and to her bitter end at the Battle of Sunda Strait, sinking just after midnight as February turned into March, 1942. Highlights in the collection date back to the naming campaign that gave her our city’s name, include documentation of President Franklin D. Roosevelt’s affinity for the Houston as his vessel of choice for sea voyages and deep sea diversions during his presidency, show haunting scenes from those infamous POW camps, and testify to the resolve of 1,000 “Houston Volunteers” who answered the call sent out by the sinking of the Houston. If these recently published photographs barely scratch your research itch, be sure to also visit the Lt. Robert B. Fulton USS Houston Letters, the William Slough USS Houston Letters, and the USS Houston Blue Bonnet Newsletters, also available for study in our Digital Library. Or, better yet, visit the permanent exhibition of the USS Houston on the second floor of the M.D. 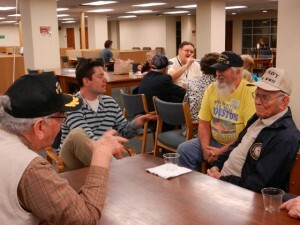 Anderson Library and continue your research with a closer look at the larger USS Houston & Military History Collections in the Special Collections Reading Room. Whether it’s a rare book printing found at long last or piece of ephemera found in an archival collection by chance, those who visit the University of Houston Special Collections almost always find something they cannot wait to share with others. In this new series, we take a closer look at what makes the University of Houston Special Collections so special–our Favorite Things. Valerie Prilop, Digital Collections Librarian, offers us the following as one of her favorite things. 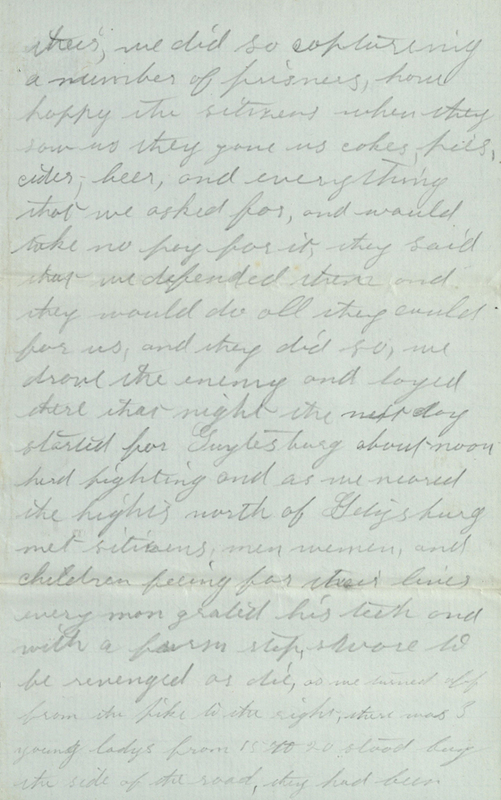 A copy of the 1945 letter, penned from the Mukden (Hoten) POW camp in Shenyang, China, is part of the Captain Albert H. Rooks Papers in our USS Houston & Military History Collections. The letter, as well as other correspondence from the Rooks Papers, can be viewed and studied in the University of Houston Special Collections Reading Room. Material related to Cdr. 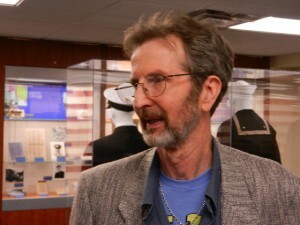 Levitt may also be found in the Cruiser Houston Collection, and additions have recently been donated by his daughter Kathie Levitt Tiedeman. 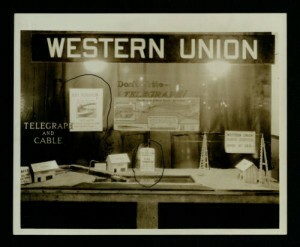 Do you have your own “favorite thing” about the University of Houston Special Collections? If so, we’d love to hear about it! Ed note: The original text of this post has been modified to reflect recently acquired materials of research significance. 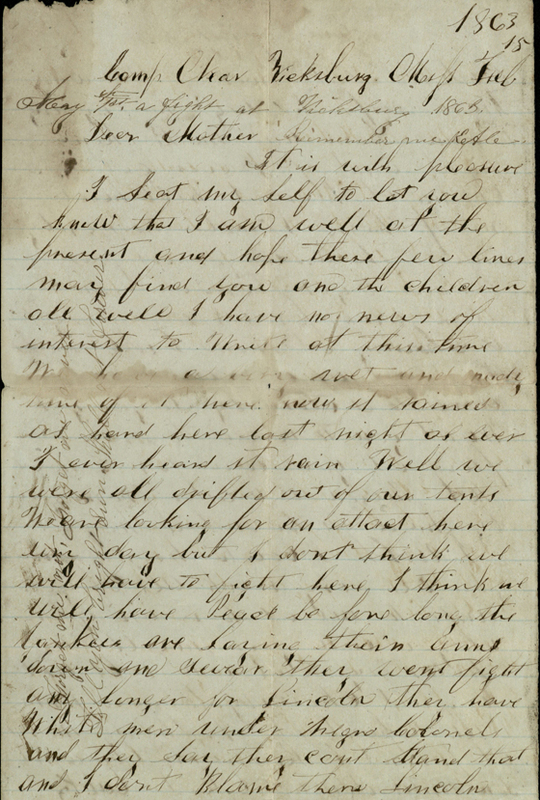 The hits just keep on coming over at the University of Houston Digital Library with last week’s publication of the Civil War Letters digital collection. With the flurry of additional items added to existing collections along with new collections going live over at the Digital Library, you may have just missed some of the new ground being broken for military historians or those with perhaps just a passing interest in Civil War history. When the location of a letter’s origin is known, a new map component accompanying this collection allows us to identify visually where the letter was written. We think Civil War buffs will appreciate this new functionality and the potential for future researchers, in this collection or those to come, is immediate and sure to be invaluable for those whose research interests are pinned to particular regions or desire to visually explore artifacts by locale. 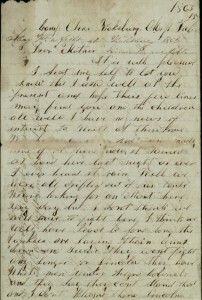 Included among these digital items are letters belonging to both Confederate soldiers (Calk and Lowther) as well as correspondence from the Union side of the conflict (Edgerton). 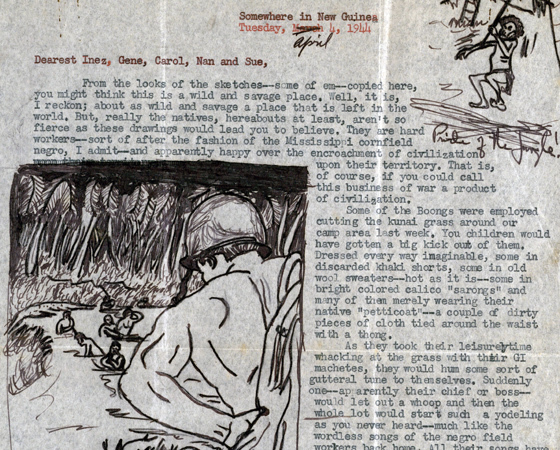 Quiet moments of correspondence cutting through the cacophony of warfare have long been prized by researchers as rich veins of information and insight. The correspondence of these brothers in arms is no different, offering personal views throughout. 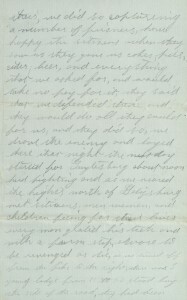 Later, Calk would write to his sister, as the noose of General Ulysses S. Grant’s siege of Vicksburg tightened in May, that he “saw many fall and heard many crys and groans of the dying and wounded,” but counts his blessings as “the Lord was good and merciful… even a ball did not touch [his] clothes though they were flying as thick as hail all around… and many fell on every side.” Following the Union’s victory at Vicksburg, along with Robert E. Lee’s defeat at Gettysburg, Calk mustered out in July 1863. A map on the collection’s homepage, peppered with various colored dots from the Midwest, through the Tennessee Valley, stretching both north and south, illustrates the far-reaching impact of a war that threatened to permanently tear a nation asunder. Spend some time exploring this new, rich, and interactive collection. 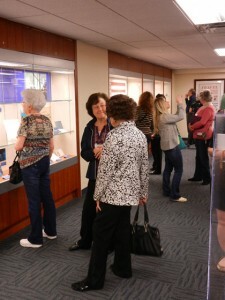 But, if the digital collection has simply served as an apéritif, we invite you to come experience these original materials in the Special Collections Reading Room. 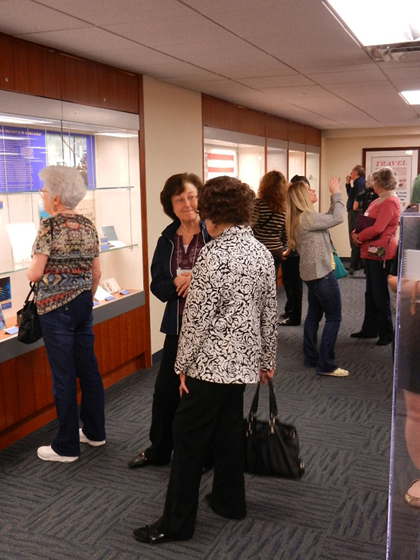 On Friday, March 14th, the UH Libraries hosted a reception for members of the USS Houston Survivors Association and the Next Generations, who were visiting Houston for their annual reunion. 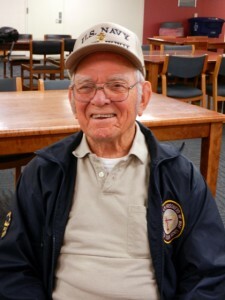 The organization was established in 1946 to bring together surviving crew members of the heavy cruiser USS Houston (CA-30), who had fought together in the Battle of the Java Sea, and spent 3 1/2 years together as prisoners of war. In 1981, the Survivors Association donated to the Libraries a set of historic documents, letters, photographs, and memorabilia which became known as the Cruiser Houston Collection. 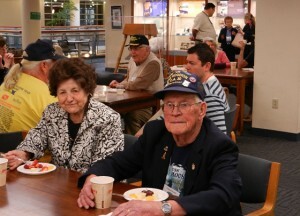 In attendance this year were survivors Bill Ingram and Howard Brooks. Ingram was the second youngest crew member on the ship, having enlisted in the Navy at seventeen. Many family members of other Houston crew members were also present, as well as historian Don Kehn, author of A Blue Sea of Blood: Deciphering the Mysterious Fate of the USS Edsall. The group enjoyed the opportunity to view the USS Houston Exhibition, have some cake and lemonade, and relax in the camaraderie of longtime friends. UH Special Collections wishes Howard Brooks a speedy recovery after his recent fall. More good news from the good people over at our Digital Library! The digital collection of Captain O.C. 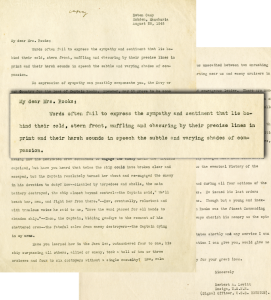 McDavid’s World War II correspondence is now live and online. An old-school Mississippi journalist, O.C. McDavid was born in Ruth, Mississippi in 1911 and started honing his newspaper chops in high school, sweeping the floor of a local print shop. As he pursued his journalism career, the outbreak of World War II brought about a fateful detour. Stationed in the Gilbert Islands, his letters home from the South Pacific resound with the wonder and insight of a professional writer. 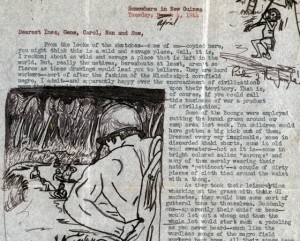 A visual artist as well (McDavid would go on to become a prolific sculptor later in life), his letters home were often punctuated with sketches and drawings from half a world away. 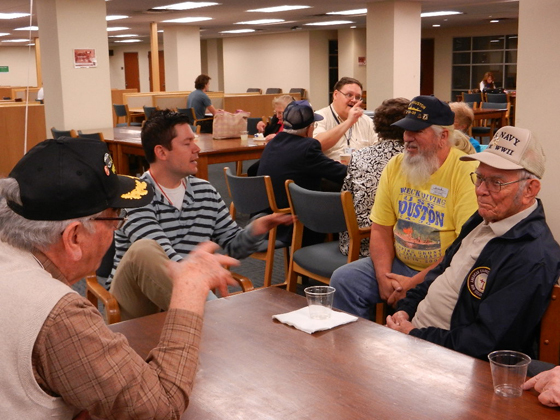 While the original materials have remained available for study in the Special Collections Reading Room, the work of the Digital Library allows patrons to remotely access and enjoy this distinct narrative of World War II. You can find more information on O.C. McDavid and his writings online or in person.